Director Hanelle Culpepper's thriller will also be available on Video-On-Demand. Los Angeles, CA (PRWEB) July 28, 2010 - Bigfoot Entertainment's latest paranormal thriller Within is set to make its television premiere on Lifetime Networks at prime time on 31st July 2010, Saturday at 9:00 pm Eastern Time. Directed by Hanelle M. Culpepper, the title will also be available on Lifetime Networks' Video-On-Demand (VOD) service from 3rd August 2010. With stunning newcomer Mia Ford making her feature film debut as a sweet but troubled Rachel Weiss, Within also stars Sammi Hanratty as best friend Michelle Lowe, Lori Heuring as Rachel's school teacher Abby Miller and Sam Jaeger as Rachel's widowed father Nathan Weiss in a suspenseful journey set in a seemingly quiet small town. The story unfolds as Rachel, who is gifted to see evil within others, may be the key to stopping a series of violent attacks against the other children in town and unlocking the mystery behind a decade-old grim disappearance. Ford was awarded in 2008 the Young Artist Award for Best Performance in a Short Film - Young Actress for her role in Far Sighted, and a nomination for Best Actress at the 2009 Strasbourg International Film Festival (France) for her role in Within, as did Hanratty. Ford's counterpart Hanratty, more intimately known as "American Girl Chrissa" from the doll based on her role in An American Girl: Chrissa Stands Strong and "The Pringles Girl" for her lasting impression in two of Pringles' commercials, made appearances in TV shows such Charmed, CSI: New York and House MD, and a lead role in a movie entitled Once in a Lifetime. Meanwhile, Jaeger is most notable in his TV roles in NBC's Parenthood as Joel Graham, as well as Eli Stone as Matt Dowd. "As an African-American woman director, I was especially excited to be presented with the opportunity to work on a mainstream general audience thriller. Black women don't often get this opportunity. And I'm overjoyed its world television premiere will be with Lifetime's sophisticated, female-driven audience,"said Culpepper. "WITHIN is a taut psychological thriller that I think keeps you glued to the screen right through the surprise twist that reveals all. I truly hope viewers will get a big bowl of popcorn and gather around the TV for a really fun and scary roller-coaster ride of a movie." The paranormal movie had its fair share of supernatural encounters on set, ranging from casts suffering from injuries to caution from a psychic warning Director Culpepper against bad spirits around the set trying to enter her life while filming. "It did freak me out a little bit," said Culpepper on the warning she received, "but there was no way I wasn't going to make this movie, and I just focused on positive energy. We managed to complete shooting in just 20 days - a crazy schedule especially considering the leads were minors - without any major disruptions; only the usual inevitable production challenges that often worked to our benefit. In fact, most "paranormal" activities that happened on set were pranks played by the cast!" After its premiere, Within is slated for repeat airings such as August 15th 2010, Sunday at 7:00pm Eastern and Pacific time / 6:00pm Central Time, and in October for Lifetime Networks' scheduling for Halloween. Rachel (Mia Ford) is a young girl with a terrifying secret. She can see evil spirits within others. After witnessing the brutal killing of her mother, she and her father (Sam Jaeger) move to a small town hoping to put the shattered pieces of their lives back together. Although Rachel continues to be haunted by images from her past, she manages to forge a strong bond with her teacher (Lori Heuring) and becomes best friends with a peculiar classmate named Michelle (Sammi Hanratty). Soon, things aren't quite how they appear when Michelle's seemingly innocent pranks turn potentially deadly, forcing Rachel to fear their friendship while looking right in the face of the malevolent spirits she sees. In a world where bad spirits never leave - they just find somewhere else to go - Rachel's visions may be the key to stopping a string of violent attacks against the town's children and unlocking the puzzle behind a devastating secret harbored by Michelle's parents (Stacy Haiduk and Brent Sexton) and a decade-old disappearance. 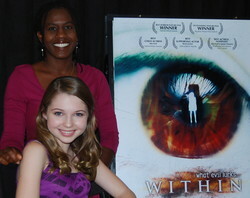 For more information about Within, please visit http://within-themovie.com. About Bigfoot Entertainment:Founded in 2004, Bigfoot Entertainment is an international entertainment company producing independent films for the global marketplace. The company finances and develops feature films, documentaries and reality TV shows, many of which have received industry accolades, festival awards and have been distributed throughout the world. Featuring both well-established and up-and-coming American and international talent, Bigfoot releases have shot on location worldwide including the United States, Hong Kong, China, Africa, Europe and Vietnam. Bigfoot Entertainment produces many of its projects at Bigfoot Studios, a wholly-owned subsidiary that encompasses six sound stages and on-site state-of-the-art post-production facilities.